North Little Rock police have arrested 18-year-old Keith Harris Jr. for his role in the shooting death of Shawn Mckeough. 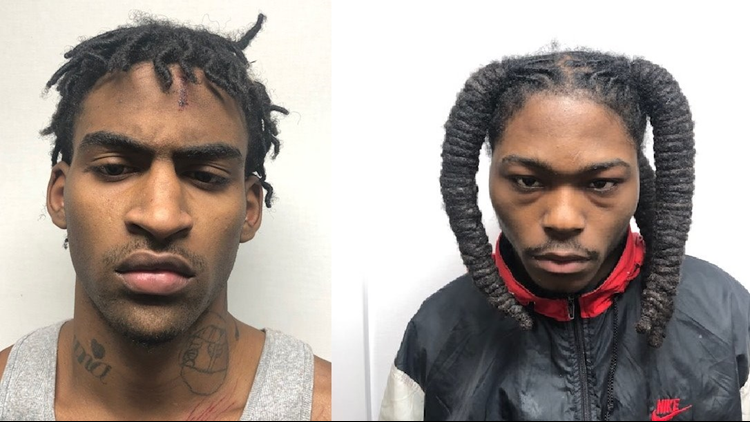 NORTH LITTLE ROCK, Ark — Two 18-year-old suspects appeared in court in North Little Rock Tuesday morning via video arraignment where they both pleaded not guilty. The judge set no bond. On Monday, police arrested Drequan Robinson, 18, as a suspect in the killing of Mckeough, an airman assigned to Little Rock Air Force Base. Later that night police arrested Keith Harris Jr., 18. Both are being charged with capital murder and aggravated robbery. Harris then appeared and pleaded not guilty. According to an arrest disposition report, during an interview, Harris said he was in a vehicle with four other individuals when recruited by Robinson to commit a robbery. Harris said he declined to go inside. However, another person in the vehicle agreed. Shawn Mckeough joined the military in 2015. He served overseas for several years. The Westbrook, Maine native just moved to Arkansas in December to work at the Little Rock Airforce Base as a Senior Airman. “He was born to protect, really,” said his lifelong friend, Kelsie Berry who spoke with us over the phone from Maine. “Super, super funny. That’s like my favorite thing about him. He made everybody laugh. Berry told us Mckeough was out to dinner with his girlfriend and friends Friday night. They called an Uber to pick up drinks at the convenience store on their way home. “Went in to grab some things and it took at turn for the worse,” Berry said. Meanwhile, documents tell us a group drove around Little Rock and North Little Rock for at least an hour trying to find a business that wasn't too busy to rob, eventually stopping at the Valero on Broadway. The documents go on to say two people with guns went inside, pointed their guns at customers yelling 'you think I’m playing, open the drawer right now' when Shawn Mckeough tackled one of them, trying to stop them. The other person, Robinson, is then accused of firing at least one shot at him. Then they left. Police identified Robinson after releasing surveillance video. Five anonymous people called saying they recognized him. Detectives believe Robinson had plans to escape to St. Louis, but he was arrested Monday night at a motel. “I was certainly surprised by it. I had heard something late last night after he was arrested. I don’t know if there’s any validity to it, again he was set up to come and turn himself in with me this morning,” said Bill James, Robinson’s attorney. Police are still working to identify the second person in the video wearing the panda hat. Both men are expected to appear back in court on May 23.